Sangetsar Lake is Also Known as Madhuri Lake Because The Popular Bollywood Movie Koyla Was Shot Here. If scenic landscapes sweep you off your feet, Sangetsar Lake, more popularly known as Madhuri Lake in Arunachal Pradesh is sure to wow you. 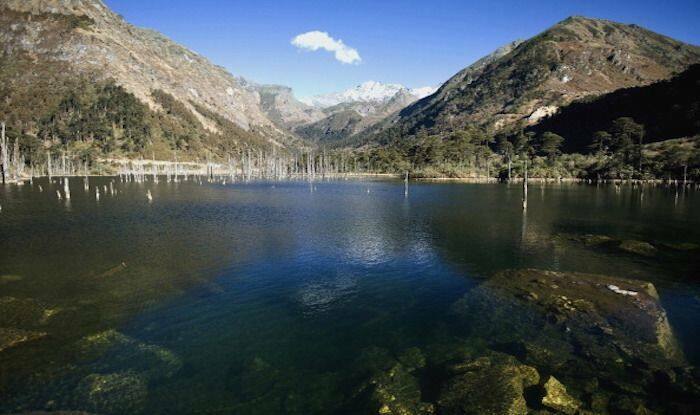 To many, it is also known as ‘Paradise lake’,about 42 kilometres from Tawang and on the way to Bum La Pass. Cool breeze envelops the entire region all year round while the lake is nestled right in between the mountains filled with pine groves making it breathtakingly beautiful. During winter these mountains are filled with snow and the lake is almost frozen. It is believed that the lake was formed after an earthquake that took place in the year 1952. This lake was popularised by a Bollywood movie which was shot here named “Koyla”. The location is off-the-beaten track, and is meant to be explored by those who love roaming in the wilderness. It is a fantastic place for a picnic if you are travelling out of Tawang for a day trip. However, it’s not easily accessible to everybody; travellers need to get a permit from the Indian Army. That’s because the track is quite dangerous; only SUVs can be taken there and that too only on clear weather days with no snowfall or rainfall. Once you’ve managed to get here, don’t miss boating on the lake. There’s an army cafeteria known as Shungatser Cafe near the lake, that serves some really delicious and hot food to travellers at a nominal rate. There’s also a waterfall falling onto the lake, which is a little seasonal and is active during the monsoons. If you’re lucky, you’ll also be able to spot yaks and golden ducks here. Remember to take out your camera when that happens. Other adventure activities that you can indulge in here are trekking, fishing, and even camping. This spectacular lake is located right on the Indo-China border at a height of 16,500 feet and is a source of tremendous pride for the country.